Marketing Information 6550 Series seating from HON brings a classic touch to the office. 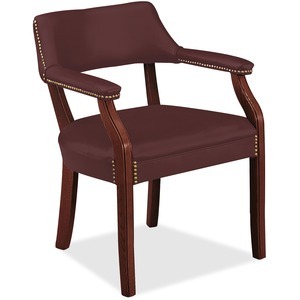 This stately wood guest chair features graceful curved arms and formal nailhead trim. The exposed parts of the frame are made from select hardwood. The open back makes small meeting areas seem more spacious. Seat and back upholstery color is Merlot, and wood finish color is Mahogany.